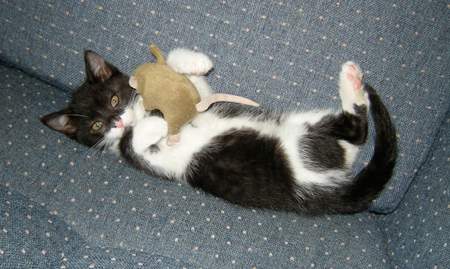 Usual Disclaimer: What you are about to see contains images of cute fluffy kitties. It has nothing to do with appliqué, so be warned if you must. 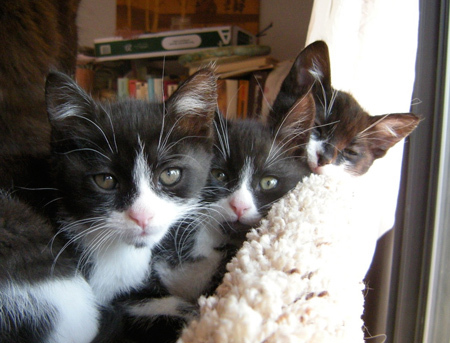 Welcome to the Third Annual Cavalcade of Kittens! In April, the Mackenzie Finishing School for Felines opened its doors for the season. 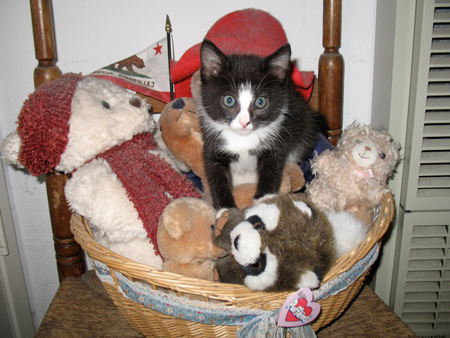 Through late November, Dana and I took care of 10 consecutive groups of underage foster kittens for the Santa Cruz County Animal Shelter, 27 little balls of fur all told. 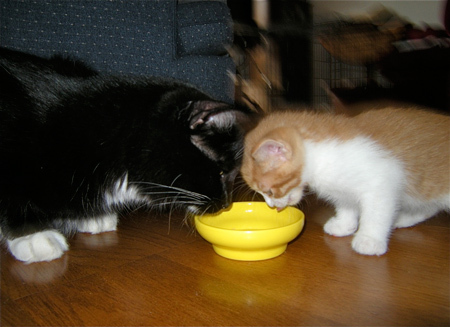 The kitties we take in are big enough to eat on their own, generally five to six weeks old, and we keep them until they’re at least eight weeks, two pounds, and in good body condition. It’s so much fun, and so rewarding to watch them grow from teensy little klutzes to sturdy healthy pre-teens who run thumping and banging around the house. 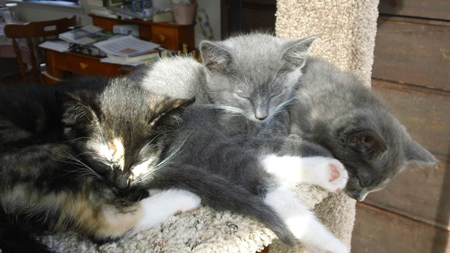 I’ll let you know right now, so that you don’t wonder or worry, that each and every one of the kittens you are about to see has gone back to the shelter, been found by someone who fell in love with them, and adopted into a forever home. 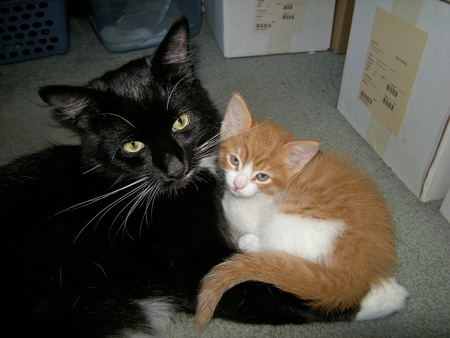 Our cat Max, who came to us as a foster just about a year ago, did fantastic with the little ones. 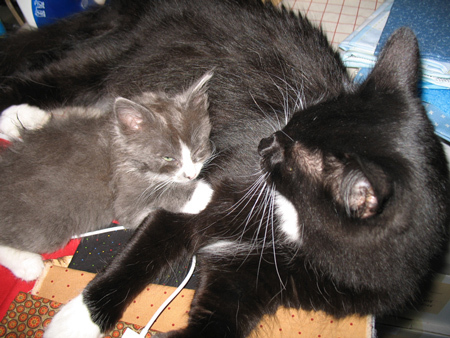 He has grown into 13 pounds of all-cat-no-fat and he’s about five times the size of the kittens, but he’s very gentle with them. He always comes to inspect the new arrivals, and once they’re grown and sturdy enough he tackles them, then hugs them and licks them all over. 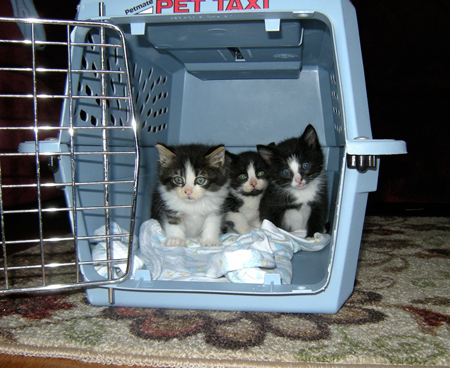 When the very first litter came into the shelter, I was so eager that I took home four! Usually our limit is three at a time but I just couldn’t help myself. 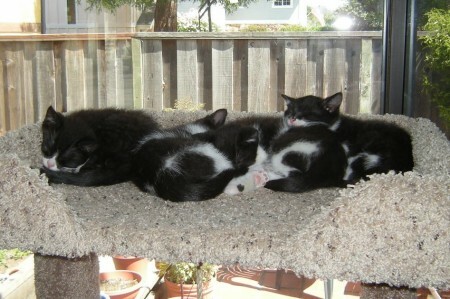 Dugan, Owen, Patrick, and Priscilla, all black-and-white “cow” cats. Patrick, cute as could be but terribly shy of hands reaching for him. Once I got ahold of him, he’d sleep on my lap for hours, but then the next time we’d go through the whole song and dance again. 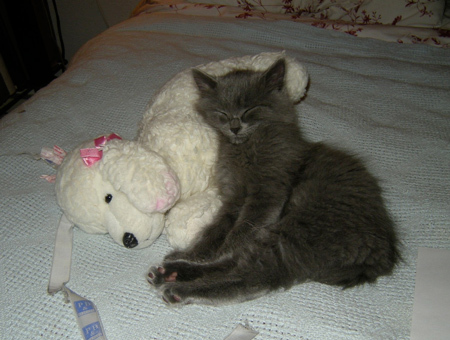 He did get better, and Dana was at the shelter when he was adopted together with another kitty friend. 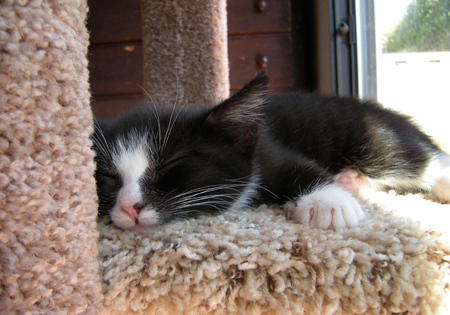 We’ve heard that he’s grown into a “zen” cat, the kind to look before he leaps, and he’s a very happy and contented boy. He LOVED his Uncle Max. 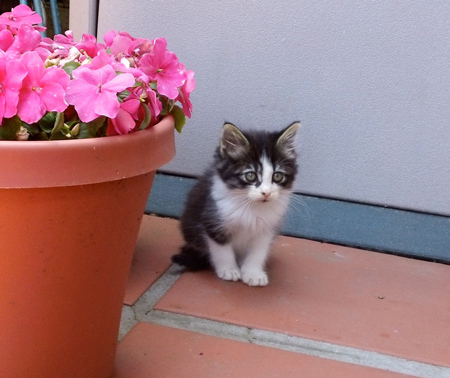 It seemed to be the year of the black-and-white cat. Our next group were Phillip, Freddie, and Percy. Newly arrived from the shelter. Nobody here but us stuffies. Breaking the black-and-white streak, next came Gypsy, Duffy, and Charlie. 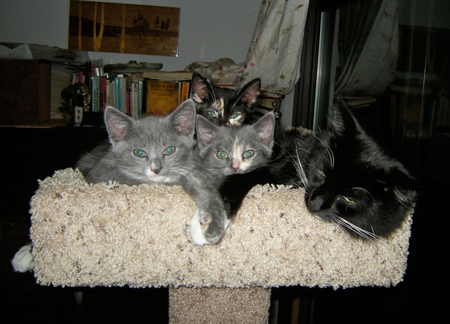 Gyspy was a tortie, Duffy a pastel tortie, and Charlie was a handsome gray-and-white boy. They were all three sweet and friendly, a joy to have around. Hangin’ with the big cat. Next we had a brother and sister, Gigi and Bodie. Smushed into the sofa cushions. Bodie was our 49th foster so we named him after a California Gold Rush town. 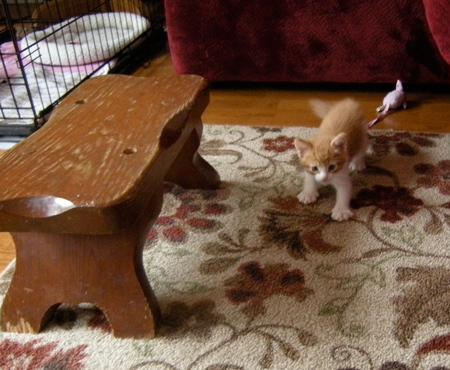 Bodie’s first step into the house. We named the girl Gigi because she looked like Gypsy, so we were thinking. G2, GG… Gigi! And loved to hang out with his Uncle Max. Max was very patient with the little ones, even where food issues were concerned. He was of course interested in their tasty kitten kibble and the occasional dollops of wet food that they got, but he would patiently wait until they were finished and then perform a good cleanup. Even when they ate out of his dish, he would just hunker down and wait until they were done. 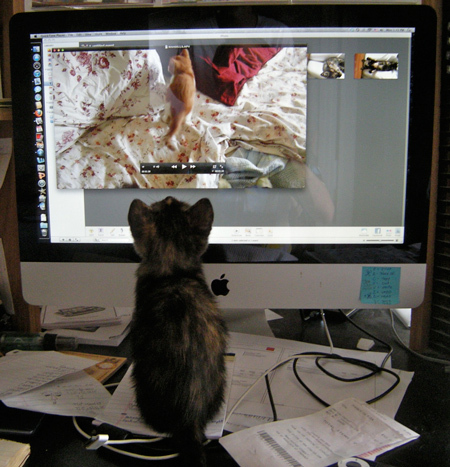 Gigi watches Bodie on the iMovie. 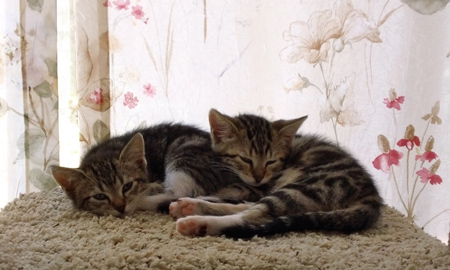 Then came a couple of extremely stripey little tabby cats, Cordelia and Bob Cat. Well, we mostly called him Bob. Uncle Max is a good pillow. 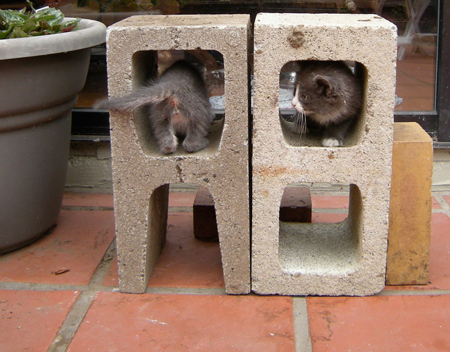 They came during the summer Olympics and we called them our Olympic kitties because one was silver and one was gold. Cordelia loved her DirecTV. 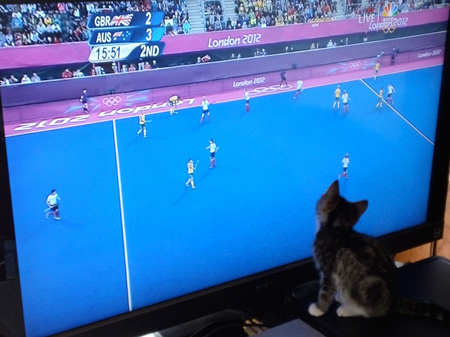 She was a big field hockey fan. I was the one who mostly helped Willie with his dogblog, and now Dana has taken over helping Max with his YouTube channel. If you’d like to keep up with Max’s video exploits, you can always visit Featuring Max as Max. Here’s one to get you started. Pushy kitties! After the stripesters we had another brother-sister combo. 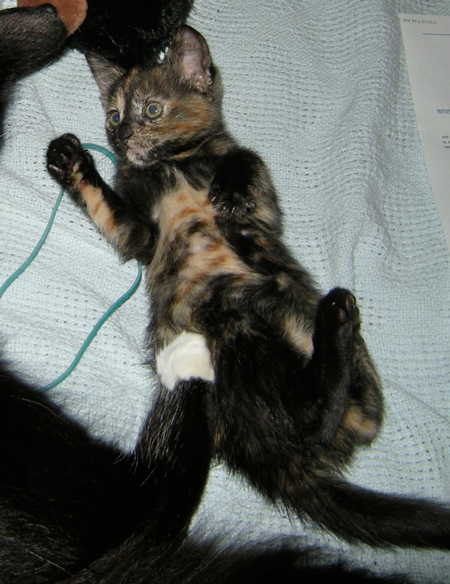 Lacey was a torbie… that is, a combination tabby and tortie. Ping looked just like a classic seal-point Siamese (though you don’t find too many of them pure-bred coming in as strays). These two were quite shy in the kennel at the shelter but once I got them home for a few days they got the whole “human” thing. Lacey got shortchanged in the tail department. 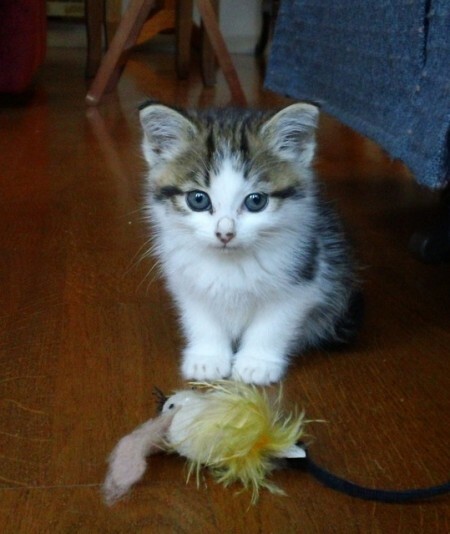 Ping got a great home ’cause of the interwebs! 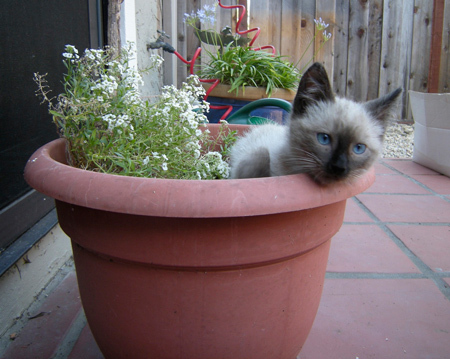 Dana put his photo up on Facebook, an old college friend saw it and told a friend of hers who wanted a Siamese kitten! The lady drove all the way down from Berkeley to get Ping, who made fast friends with her older seal-point, and the two are now joined at the hip. 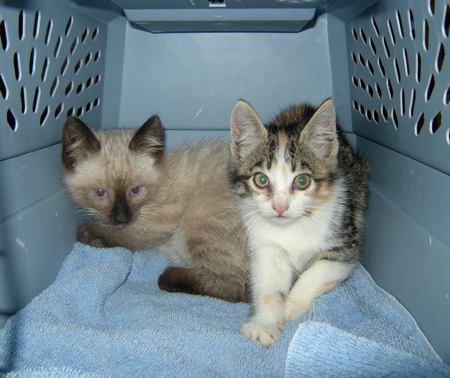 There are often numerous kittens at the shelter at a time who need to go out for foster. There was a litter of four and there was a tiny little single. 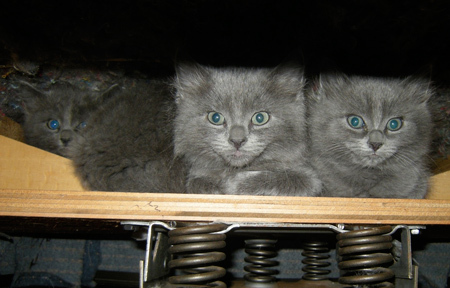 With the permission of the staff, I took two of the litter and put them together with the single to see how they would get along. No problem! I took this blended group of three home with me. 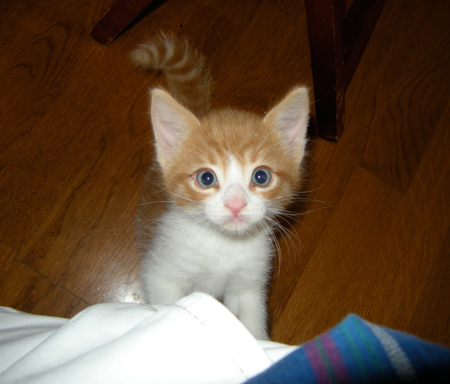 The little guy who had come in alone weighed in at a whopping 12 ounces, covered in fleas and with a broken tail, but he didn’t let any of that slow him down. He had a spirit as big as he was small, and knew that humans would be the ones to help him overcome his sketchy start in life. Dana named him Smidgen. In this picture you can’t tell, but Smidgie was about half the size of the others. 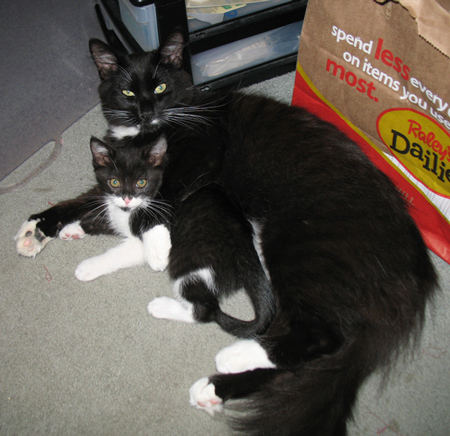 Devon snuggles up to Max. 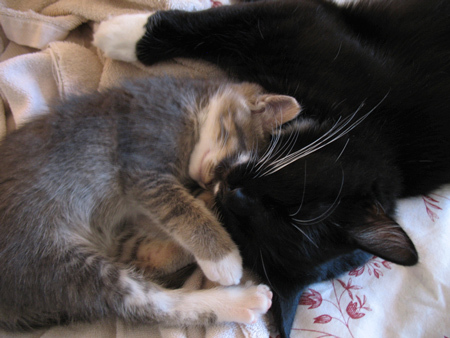 The bathing is very soothing to the kittens, just like momma used to do. Off to sleepy-land, with Max as a down pillow. 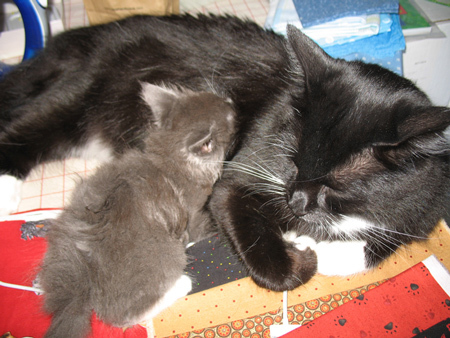 They’re on my ironing board, testing out the fabrics I was pulling for a project. 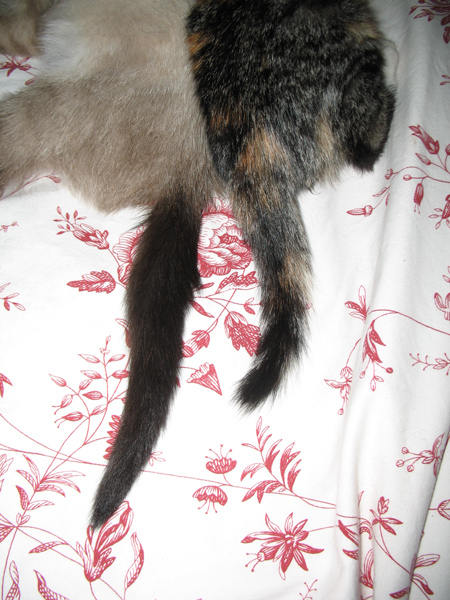 Smidgen’s tail improved and he seemed to have full function of it, with just a little “personality” kink at the base. Here’s Devon’s official shelter glamour shot. 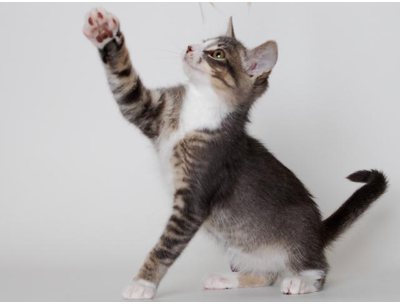 We have a fantastic volunteer photography team who take beautiful pictures for the website adoption listings. 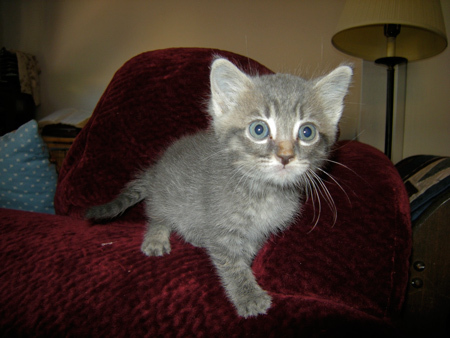 While I was at the shelter making arrangements to bring the three grays back for adoption, one of the animal care staff told me about a single kitten needing foster down at the south-county branch. She said this kitty was beyond cute. I told her I would try to swing it. Once the grays were back, I drove down to Watsonville, picked up the baby, brought her back to Santa Cruz, and introduced her to a pair. Like peas and carrots! Another blended group came home with me. Isabel, cute as a button. The other two were Amber and Elliott. 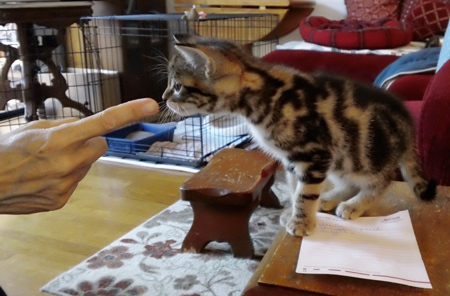 Amber had a gorgeous striking gold-and-black classic tabby coat. 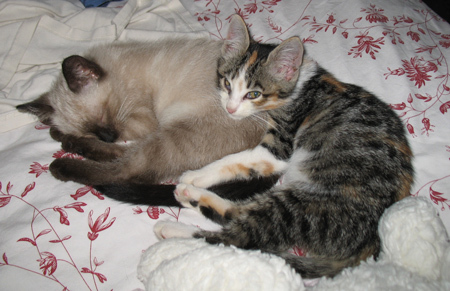 Elliott (left in the photo below) looked like Isabel from the front but was mostly white in the back. I often drive down to the south-county facility to pick up fosters. This saves the staff the trouble of arranging for transport, and it’s just about 20 minutes down the coast. 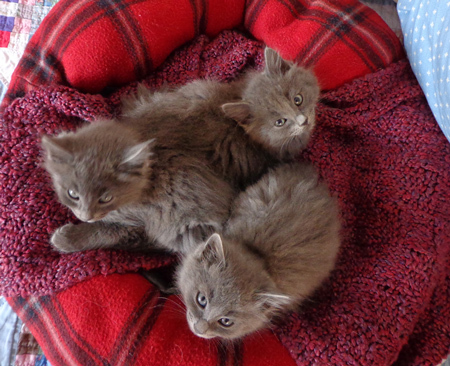 Next I motored down to Watsonville and met two kittens who were both singles, Lewis and Grover. Lewis is the buff tiger and Grover is the charcoal gray boy. 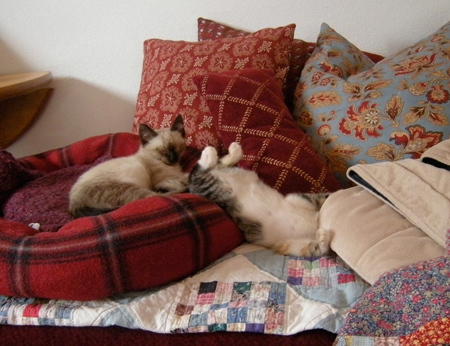 These were the first batch to not graduate from the Mackenzie Finishing School for Felines. They were both cuddly, affectionate sweethearts but Grover had had a very sketch start in life and the poor little thing was plagued with a variety of maladies. All treatable, thank goodness! 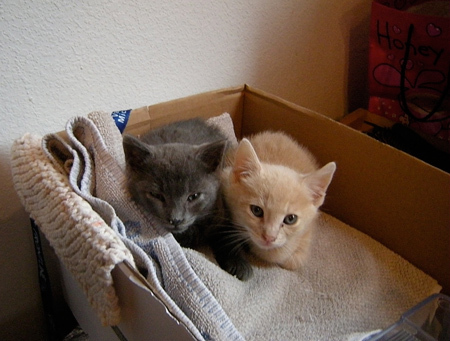 The pair went back to the shelter for a course of treatment and then went into another foster home that was better equipped to keep them separate from resident cats until they were all better. 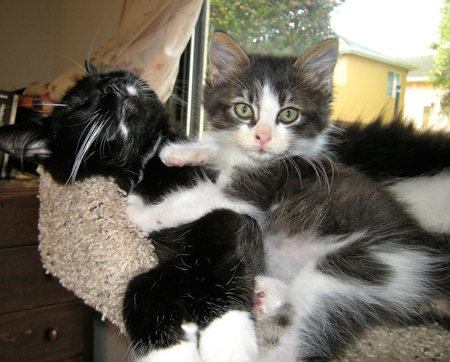 These sweet guys were adopted together. The family named then Dawn and Dusk. I was like, wait a minute… Dawn? He’s a boy! But they didn’t care about that, the kids were just so excited to have them. 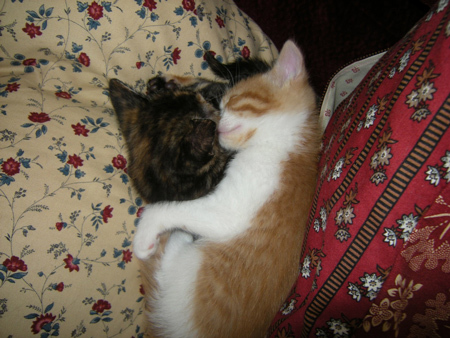 Happy ending for some darling kittens. The last batch of 2012 were three gray fuzzybritches. Dorian Gray, Dobie Gray, and Macy Gray. 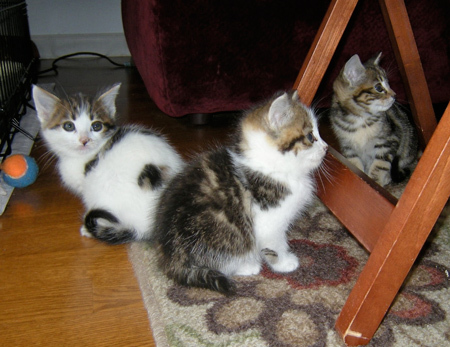 A lot of the shy kittens find the secret hiding place under the easy chair. The next day, they’re sleeping out in the open. Goal Number One: Check! And pretty soon they’re over it and chillin’. Here are their adoption photos. 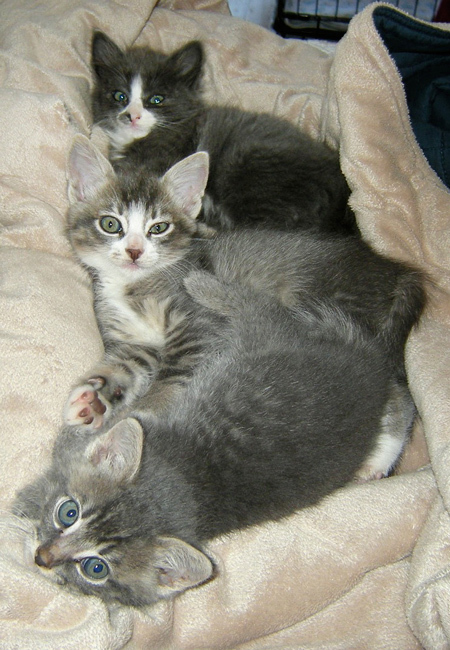 Two were adopted together and the third went shortly after that. 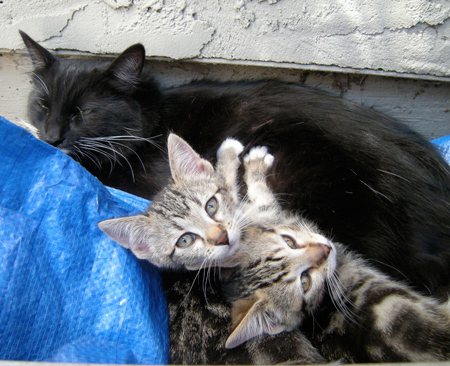 Sigh, no more kittens until next spring. For now it’s just me, Dana, and our wonderful Max. Would you like to see his whisker excercises? He’s been the best uncle I could have hoped for. The very best to you and yours, including all your furry friends! 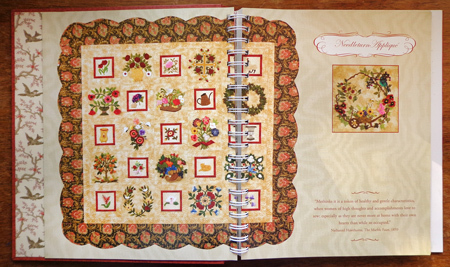 Janice Vaine’s beautiful book The Art of Elegant Hand Embroidery, Embellishment, and Appliqué goes to Lea Rae Kuntner! Congratulations Lea Rae! Enjoy. Happy holidays to you, all the other commenters, and to everyone who reads All About Appliqué. I appreciate sharing an enthusiasm for appliqué with you so much! 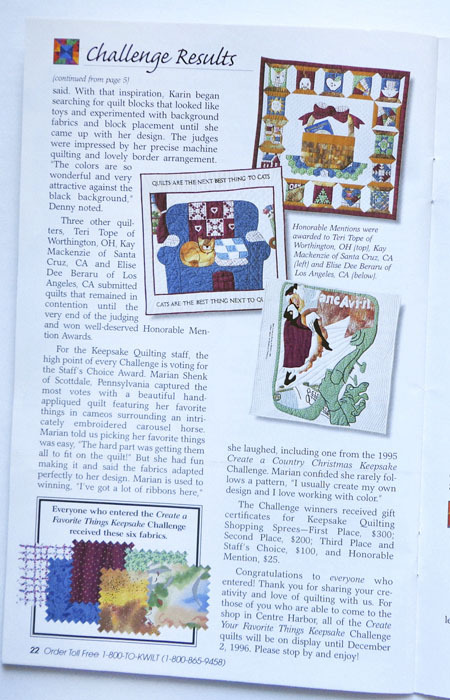 Quiltmaker magazine is having a fun Countdown to Christmas over on their blog, Quilty Pleasures. It started on December 3 so be sure to scroll back and catch all the very fun articles they’ve posted full of quilty holiday goodies. 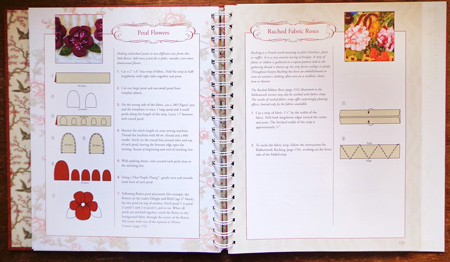 I’m pleased to report that you’ll see my Plum Puddings in the countdown! 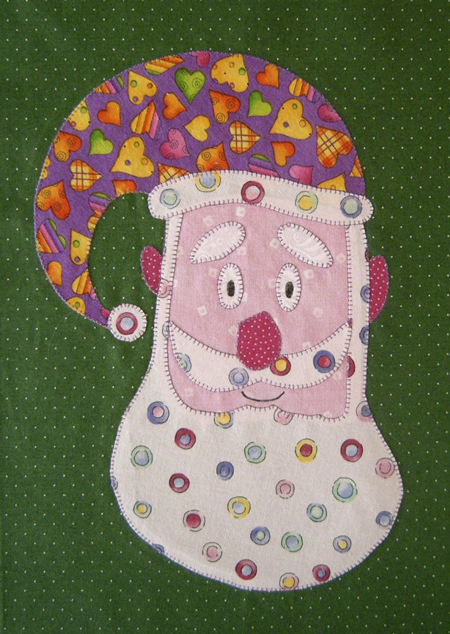 After I posted Goofy Santa, many of you commented that you felt Dana could have a second career as an appliqué artist. I’ll share with you that back in the day, before I learned computer illustration, I used to ask Dana to draw things for me sometimes. He drew the scene that won me an Honorable Mention in the 1996 Keepsake Challenge! Dana also drew the plum pudding for me. There’s a story there. Dana’s mom always made plum pudding for the holidays, the kind you steam on the top of the stove. Dana never thought he liked it because it had hard sauce on top of it. A few years went by and then he found out that hard sauce was “frosting.” All of a sudden plum pudding wasn’t so bad! I have a super-sized holiday treat this month as our featured book and giveaway! 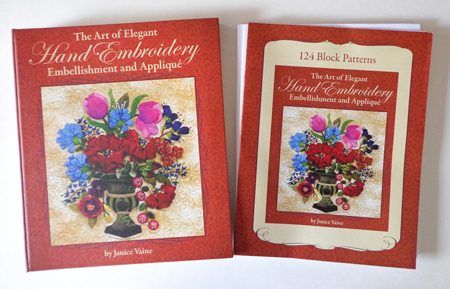 Landauer Publishing sent me a copy of Janice Vaine’s The Art of Elegant Hand Embroidery, Embellishment, and Appliqué. It’s truly something special. It’s a great big, hard-cover, spiral-bound book, and with it Landauer also sent me the companion pack of 124 Block Patterns. 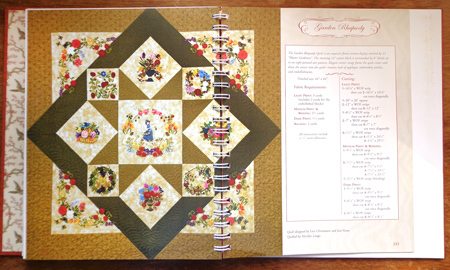 The book and the companion patterns will both go to one lucky reader. If you’d like to win them, please leave a comment here on this post before 7:00 p.m. California time on Sunday, December 9. The fine print: Open to U.S. and Canada mailing addresses only. Comments left on a different post are not eligible. Replies to an email feed are not eligible. 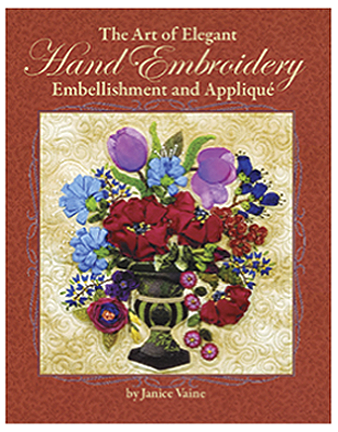 Many thanks to Landauer for providing us this wonderful resource for appliqué, embroidery, and embellishment enthusiasts. Good luck and happy holidays to all!! 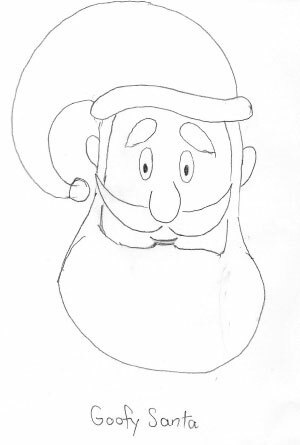 Some years ago when I was working on a Christmas book, my DH Dana drew a sketch of Santa. From the look of him he was dubbed Goofy Santa. G.S. didn’t fit in and never found a place to be. He was filed away. 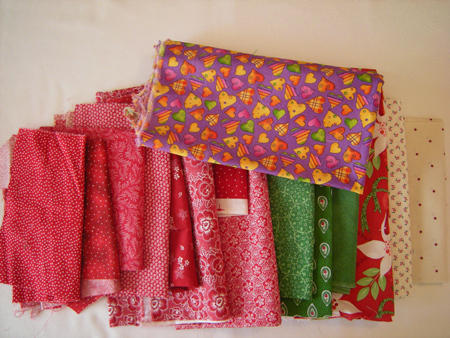 “You’re going to pick all the fabrics and I’ll show you how to make the fusible-web templates,” I continued. I finished rendering his pencil sketch in Illustrator and printed it out. 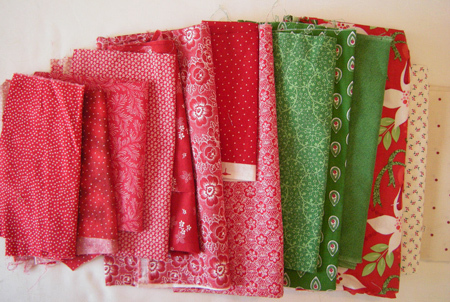 I turned him loose on my fabric stash and he started pulling out traditional Christmassy reds and greens. I was working on something else, quietly enjoying the fact that Dana was having a good time in my world. I looked over and saw this. Cue the Alfred Hitchcock music. “What’s that?” I asked, pointing to the purple orange, and chartreuse anomaly. “I thought that would be good for the hat,” he said. “It doesn’t go,” I said. “What doesn’t go?” he asked. “It’s all just wavelengths,” he countered. “It’s not gonna work,” I maintained. “But… I really like it,” he wistfully replied. 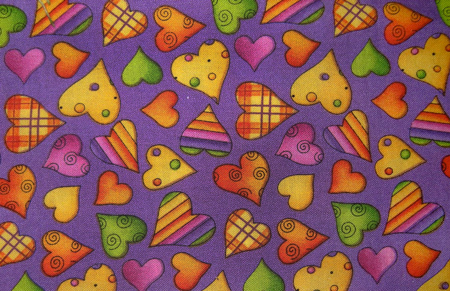 Then he was like a kid in a candy store, quickly assembling other fabrics to go with the purple and orange hat. Then I showed him each step of the fusible appliqué process, and he did everything except the sewing. I give you… Dana’s Goofy Santa.